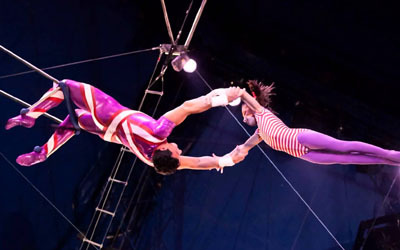 Trapeze acts may be static, spinning (rigged from a single point), swinging or flying, and may be performed solo, double, triple or as a group act. This act reflects a scarf act but is more spectacular and advantageous. Numerous girls on Perches performing beautiful choreographed manoeuvres and tricks high in the air . Numerous acrobats performing fast moving somersaults and tricks including daring leaps though a blazing ring of fire and leaps and somersaults over a stationary car. This is fast and slick and extremely exciting. 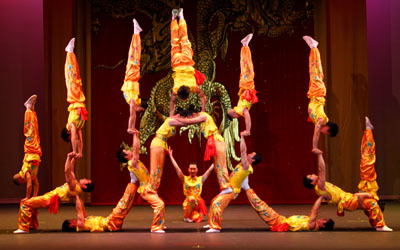 A group of acrobats performing shoulder catches, tumbling sequences and human pyramids.